Communities wanting double yellow lines and other traffic restrictions in Barnsley have been dealt a second blow with a warning that council staff shortages means any applications for new schemes will now face a long delay. 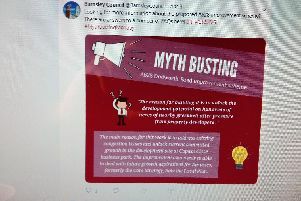 Such measures are dealt with under legislation called Traffic Regulation Orders and Barnsley Council only funds schemes which are needed on urgent safety grounds, in practice leaving others to localised area councils and ward alliances to fund. Although the installation work for measures such as yellow lines may be relatively inexpensive, the costs quoted run into thousands of pounds because of the legal processes involved and the potential for dealing with objections. One scheme, covering The Green, in Penistone was rejected by Barnsley Council because the money set aside by the town’s ward alliance was calculated to be thousands of pounds to low to cover potential costs if objections were made. Now Barnsley’s South Area Council members want to spend around £6,500 for a TRO to help improve traffic conditions in Blythe Street, Wombwell, but have been warned of long delays. An area council meeting was told there were now limited numbers of officers who were all committed to existing work, meaning long delays for new projects could be expected. Council officer Peter Mirfin told the meeting high priority cases would be funded by the central body of Barnsley Council, but other cases where traffic flow and annoyance were the driving forces, would be left to other localised bodies to fund. South Area Council income from fines levied by wardens enforcing littering and parking regulations in the area and they want to fund the TRO from that budget. However, members have now agreed to ask for talks with the council’s highways department and to re-assess the way they allocate cash available from fines income in future. Coun Lamb said he was “decidedly uncomfortable” about the system of funding TROs and told the meeting: “It is the same old thing of funding what should be centrally funded activity. Coun Jim Andrews said he was happy to use the Kingdom income on such projects, but was concerned about the highways department and suggested the area council contact them for further discussions.